Q] Does this game have a story? A] Final Fight Revenge is meant to take place shortly after the first game. There isn't much of a story to it other than the Mad Gears trying to reform and Jessica has gone missing again. Jessica never appears in the game itself, and hardly any of the endings even mention her. I don't think this game is supposed to be canon anyway. Q] Is it possible to play as Belger? A] There seems to be no official code for either the arcade of SEGA Saturn versions to make Belger selectable. There are Action Replay codes listed on some cheat sites for the Saturn port, but I haven't been able to get them to work. So it doesn't seem like Belger can be made playable at the moment. Q] What's the deal with the SEGA Saturn version? A] There were two releases of the Saturn port. One was the standard version, which just included the game, manual and disc in a jewel case. But there was also a box set edition which included a 4 Meg RAM cartridge, which is required to play the game. Both versions are expensive, as not many copies were made. Given how rare it is, Saturn Final Fight Revenge doesn't appear on eBay that often. But when it does, expect to pay over $100 for the standard edition, and even more for the box set version. As mentioned above, a 4 Meg RAM cart is needed to play the game. The RAM cart slots into the SEGA Saturn console itself. RAM carts are easy to get from eBay, and were available in box sets for several other SEGA Saturn games (including Vampire Savior and X-Men Vs. Street Fighter). Finally, the Saturn version has an English language option. Turn on the console without the disc in and the boot menu will appear. You can set the Saturn's language to English here. Do so and then put the game disc in and start it. When you play, the game's endings will be in English. Q] Was this game going to be released for the SEGA Dreamcast? A] Some sites mention that a Dreamcast port was announced, but then cancelled. I don't if development of a Dreamcast version was ever started, but it seems unlikely to me. The graphics would have needed to be completely overhauled on the Dreamcast to compete with other fighting games on the system (like Virtua Fighter 3tb, Soulcalibur and later Dead or Alive 2). And since the gameplay is lackluster that would have needed to have been changed a lot also, which would have meant even more work. Q] Was this game going to be released outside Japan? A] Given that it was developed by an American team, and the fact that the Saturn version has an English language option in it, I would have thought that, at some stage, Capcom had intended to bring it over to America. But then they must have thought it wasn't worth it. The arcade version, released in 1999, was on an unpopular board (the ST-V, which was about as powerful as the SEGA Saturn) and the game looked badly outdated compared to other fighting games. The SEGA Saturn version was released in Japan in the year 2000 -the console had been dead for over a year by that point, and the Dreamcast had been released. As mentioned above, there were rumors of a Dreamcast version, but that never happened. Q] Who were the voice actors and actresses for this game? 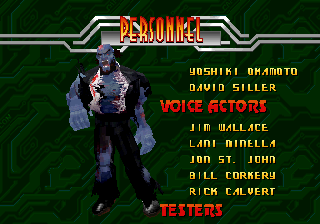 In the credits, Jim Wallace, Lani Minella, Jon St. John, Bill Corkery and Rick Calvery are listed under the voice actors. Unfortunately, the credits don't list who voiced who. Safe to say that Lani Minella, the only voice actress, would have voiced Poison, the only female character. Lani has done voice acting work in a lot of stuff -just check her Wikipedia page -such as doing the voices for Ivy in the Soulcalibur series and Rogue in Sonic Adventure 2. Jon St. John is the other big name on the voice acting credits. He's voiced Duke Nukem in the majority of the games the character has appeared in, such as Duke Nukem 3D and Duke Nukem Forever. He also voices Big the Cat from the Sonic the Hedgehog series. Guy's voice actor is not credited. It is most likely Tetsuya Iwanaga doing his voice, who voiced him in Street Fighter Alpha 2 and 3. I think for Final Fight Revenge, all of Guy's speech was actually taken from the Alpha series. Not sure why Tetsuya wasn't credited though.